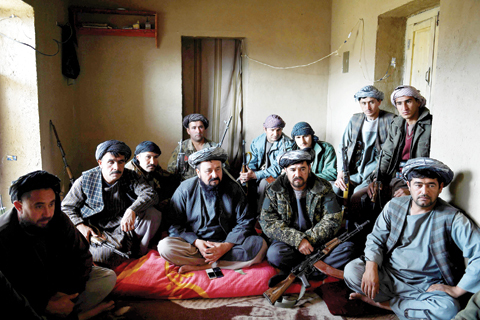 QARA GHOILY: Flanked by shaggy-haired gunmen, Commander Ghulam Farooq peered out from a hilltop at the biggest military prize of his storied career as a warlord-a mud-walled Afghan village captured after five years of Taleban control. The village of Qara Ghoily in the remote northwestern badlands bordering Turkmenistan offers a rare glimpse into life under Taleban rule and encapsulates governance failures that have helped the Islamists gain ground against NATO-backed Afghan forces. They also kept a chokehold on social freedoms, a throwback to their 1996-2001 rule that made them international pariahs, including a ban on music, shaving of beards and hip Hollywood hairstyles. But despite their austere vision of Islam, the Taleban shored up support by restoring a modicum of order in the village through an effective sharia-inspired judicial system, filling a vacuum left by a Western-backed government seen as inept and corrupt. The testimony highlights the anguished choices faced by a population seemingly trapped between two evils and helps explain the insurgency’s stunning rise despite a decade of costly Western intervention. The Taleban remain largely unpopular in urban centres, but in many rural areas the puritanical movement has entrenched itself among alienated groups, competing directly with the government for public loyalty. The Taleban now control more territory than in any year since they were toppled from power in a 2001 US-led invasion, with the UN estimating that nearly half of all districts across Afghanistan are at risk of falling. NATO-backed Afghan security operations that claim to kill scores of militants on a daily basis are causing the “displacement of the insurgency, not its eradication”, a Western official in Kabul told AFP. The Afghan government has frequently lashed out at neighboring Pakistan for nurturing the Taleban, while ignoring their local support base, which the official stressed cannot be uprooted by military force alone. Commander Farooq, 49, is part of a constellation of informal militia groups seeking to bolster Afghan forces struggling to beat back the lethal insurgency as they suffer record casualties and a growing spate of desertions. Unregulated and unaccountable, such groups are often accused of banditry and predatory behaviour that in some areas has driven Afghans into the arms of the insurgents, seeking protection. But Farooq, a Soviet-era warrior who fought alongside the legendary resistance fighter Ahmad Shah Massoud, styles himself as a formidable bulwark against the Taleban. He managed to do what government forces could not for five years-dislodge the Taleban from Qara Ghoily in an offensive that left an entire terraced hillock in the village gutted after being slammed by rockets. The insurgents escaped on motorbikes, villagers recalled, planting landmines and booby traps in their homes and backyards as they fled. Joining the Taleban exodus were around 60 families from the village of 2,000 people, which is hemmed between caramel-coloured hills that cut through a hotbed of insurgency.